Regain your hair in 1 session! With more and more technical advancements occurring in the cosmetic field, the existing manual surgical work is getting replaced by robotic arms. Similarly, the FUE procedure has also now been automated by employing a device known as S.A.F.E.R. * device. The procedure is called the Trans FER technique. The major drawbacks or imperfections in the conventional procedure are rectified in this method. Divine Cosmetic Surgery is one among the few centers in the country that keep pace with the technical advancements. Our objective is to bring the latest medical technology so that our patients get cent-percent satisfaction. Our founder, Dr. Amit Gupta, with more than 5 years of excellence in the field of hair transplant, has introduced robotic hair transplant in the country. Several factors affect the success rate of the conventional FUE procedure. Some of these factors are graft loss, damage to the follicle, patient fatigue, restricted number of grafts per session, etc. These defects are overcome by the introduction of the robotic SAFER device. The advantage of this procedure is that it involves no touch. 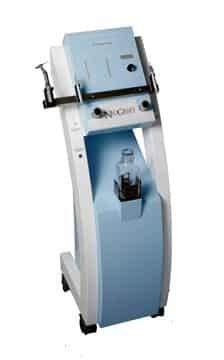 The SAFER device is able to reduce wastage rates of grafts to less than 1% which is even better than the FUHT procedure. The special device, which aids in suction of the grafts, also aids in reducing time required to extract the grafts, thus reducing patient and assistant fatigue. Better survival of the grafts, no damage to the hair and related advantages are the main highlight of this automated procedure. Moreover, the grafts are untouched and they are inserted using the robotic arm. After rapidly harvesting the grafts, they are stored and sorted appropriately. They are then implanted without pain. Over 1,500 grafts are transplanted by the Trans F.E.R. S.A.F.E.R device within 3 hours. In 4 hours, about 2,000 grafts can be transplanted. 1. Nearly 100 % graft survival. 2. More sessions can be done in a short time period. 4. Increased patient and surgeon comfort.